A freak discovery, fate and a fascination with dinosaurs are behind a scientific breakthrough that has led to the identification of a new prehistoric species. Weewarrasauras pobeni is the first dinosaur to be named in New South Wales in almost a century, following a chance discovery of a jawbone fragment in a bucket of opal rubble near Lightning Ridge. It was a two-legged, plant-eating dinosaur about the size of a kelpie dog that roamed the ancient floodplains in the state’s north 100 million years ago. The name honours the Wee Warra opal field, where the fossil was found, and opal buyer Mike Poben, who saw something special in the specimen and donated it for research. “I was drawn to it straight away,” Mr Poben said. Mr Poben came across the fossil five years ago and shared it with palaeontologist Dr Phil Bell from the University of New England in Armidale. “I remember Mike showing me the specimen, and my jaw dropped,” Dr Bell said. Dr Bell and his team spent the past two years investigating and identifying the 100-million-year-old jaw. The University of New England is now looking into acquiring mines known to produce fossils. “Unfortunately, the fossil remnants we see are almost always part of mining spoil… but on another hand, we would never get to see even those fragments if it wasn’t for mining,” Dr Bell said. 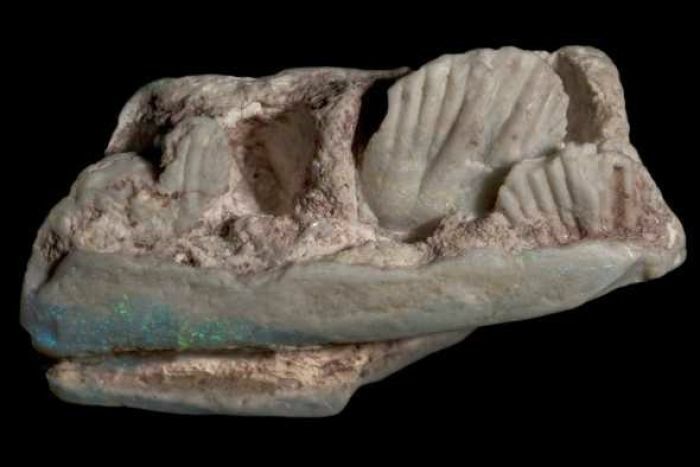 The Weewarrasaurus jaw is now part of the Australian Opal Centre collection, the world’s most diverse public collection of opalised fossils. Mr Poben’s fascination with fossils remains strong and he continues to collect and inspect opal fragments. He plans to donate his collection to the Opal Centre. “I think they have to stay in Australia, and they need to be on display in Lightning Ridge. That’s where they belong,” he said.